A founding member and bass player of the seminal Xinjiang Rock band Shetou and the Kazakh experimental folk band IZ (est. 2003), Wu Junde is a legendary figure in both Rock and Folk scenes in China. Brought up in the cultural melting pot of Xinjiang province of North-West China he absorbed multiple influences that made up his musical identity. After a spell as bass payer for Mongolian heavyweights, Hanggai, in 2007, he set up the project Traveler which gave birth to the sound of the track featured on this release – a fusion of North Western Chinese ethnic influences, Folk, and his signature moody, dark Rock and Roll. Hani Union is the latest in a strong tradition of Mongolian bands emerging from Inner Mongolia; the name "Hani" represents unity. This band strive to “Unite and make music,” whether it be the oldest folk songs or the integration of a variety of modern rhythms, elements of world music, to create the next generation of grass roots music. The five young members seek, in their own words, to return music to it's essence. The name Buyi refers to a commoner who wears cotton clothes. Formed in 1995, the ethnic rock band Buyi are true veterans of the Chinese rock scene and have stayed pure to their ideals, touring tirelessly and releasing albums in droves. The band began their musical career in their homeland Ning Xia Autonomous Region in Northwest China. For five years, they remained a local band performing across free region, gaining a fervent local following. Having been based in Beijing for over a decade, Buyi have been hailed as pure and emotional, combining the local folk music of Northwest China and classical Chinese instruments with an unmistakable Chinese Rock attitude. South City Second Brother has for many years been the most notable and maybe the only modern artist to successfully capture the spirit of Beijing's folk/street opera music tradition and the humour of the comedy tradition of “cross talk,” and present it in a modern musical context. Having given birth this new musical genre he then named it “Talk Show Rap” and has carved a special place for himself in Beijing's varied underground music scene. His use of traditional instruments and melodies has been an inspiration to those seeking new musical identity in China's modern urban reality. Legendary drummer shouts out traditional Chinese North-Western folk songs with ZHAO Muyang. Born in Ningxia Province in 1969, Muyang has absorbed the root of North-Western essences in his blood. His songs, with guitars and drums carefully mingled with Sanxian and Bangu, even Tabla, have smoothly conveyed his understanding of folk songs in a modern and transcendental way. Man Hu, meaning The Fierce Tigers, take their name from their ethnic Totem. A sub-branch of the Yi ethnic group, the Sani people are indigenous to the Stone Forest region of Yunnan Province, South-West China. Man Hu have dedicated more than ten years to the study and presentation of the unique Sani music, within the broader rich tradition of Yi music in general. Although they rarely leave their homeland they have represented the Sani People on a number of domestic TV shows and are part of a wider Chinese rekindling of interest in ethnic roots. HorseRadio is the dialogue between ancient and modern, a story from a wordless book or from the old man in the sunset crooning in the old style. Even if the words have lost their poetic spirituality, the heart still hears a deep song for the past. Has established in 2012, HorseRadio is a band of traditional folk and experimental modse, a new interpretation of the ancient. HorseRadio is experiment in alternative music of Mongolia. Having formed Wild Children in Hangzhou in 1995, Gansu singer-songwriters Suo and Zhang spent months traversing China, following the course of the Yellow River and meeting with folk musicians along the way, before eventually settling in Beijing. Wild Children, with their earthy northwestern demeanours and use of traditional Chinese instruments, amassed a loyal following. But following Suo's death, Zhang took to the road once more. He ultimately wound up in Dali, which with its agreeable climate and hemp fields has often proved a magnet for the country's musicians. Zhang returned to Beijing for a solo show, where he briefly reunited with Weiwei and Guo for a handful of Wild Children songs. From 2010, the trio began to play together once a year as part of the Big River folk music get together, but Children were careful to refrain from using the Wild Children name. 'Every time we played, friends and fans would ask us when we were going to reform Wild Children,' says Zhang. Read an article about the band in Timeout Shanghai. Ajam is a group comprised of three of Xinjiang 's (North-West China ) Uighur people's leading young musicians, Abduwali Sattar, Abdusalam Abdulla and Oilmurat Aniwar. The evocative music of one of China's least understood ethnic groups holds a unique place within the central Asian Turkic music tradition. All classically trained, well travelled, and holding roles in prestigiousl music academies the three have cultivated the Ajam project over more than five years to help promote the Uighur music of their homeland. After participating and witnessing the recent three decades of rock music development in China, Muyang had established his fame as one of the legendary rock drummer who had involved in many signature albums with different bands, of which many were recognized as milestone albums in Chinese rock music history. Meanwhile he continuously travelled and learned from local artists from North-Western and South-Western China, developing his own style in songs like “Way of the Heroes” and “Enduring”. Featuring his childhood memories of Shaanxi Opera from his parents, Muyang had condensed his emotions of an earliest generation of Chinese independent musician together with a folk singer who wandered almost all his life, roared his piercing sanded voice above the concrete forest and almost immediately bring in a wave of North-Western sandstorm. Sam Debell A student of Chinese since 1995 and a resident in China for 18 years, Sam has become a well known figure in the Chinese music scene owing to his work as both a musician, promoter, and venue owner. His Speakeasy Bar was an institution in Yunnan as the first, and at the time only live venue for non-mainstream music between 2001 and 2010. It was through this bar's role as a venue for touring bands that Sam became acquainted with the national music scene. Through his work with the Yunnan band Shanren, Sam has gradually become a de facto expert and is well versed in the music and dialects of the region. Since returning to Yunnan in 2015, Sam set up Sea of Wood Culture Dissemination company, to which Manhu band are contracted artists. This company has been dedicated to filming and recording of ethnic arts in Yunnan and also to organizing cultural exchange programs, workshops, tours and festivals. Sam was the compiler of The World Music Networks's Lost in China compilation. He is the owner of 'The Turtle' Live music venue in Kunming. The CD was donated by Riverboat Records, so all of your contribution goes to support the magazine and radio show. We thank them for their support! This album features artists that are seminal in this movement alongside undiscovered gems, barely known even in China. From the best-known to the least, none have been heard overseas before, from the Wild Children who walked out of the deserts of Gansu in the nineties to capture the imagination of the generation and help lay the foundation of Chinese alternative music, to the shy folk ensemble Manhu, who’ve rarely been seen outside of their Stone Forest enclave in Yunnan. 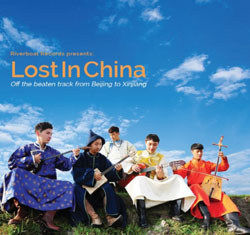 Whether it is South City Second Brother, capturing the spirit of Beijing’s street opera or Kox, a group of professional Kazakh musicians playing traditional music in their spare time that they never thought anyone would be interested in hearing, these are artists who have been waiting to redefine China’s musical relationship with the world.